Farm to Table. Home to Heart. Growing up in the Amish Country of Southern Pennsylvania was a remarkable authentic farm to table experience. My mother knew her away around the Amish market like it was her own culinary playground. Mother’s grandparents were Mennonite farmers and sold their produce every Wednesday and Saturday at the same farmers market we haunted not far from our family’s house. My grandmother and mother instilled in me the importance of consuming fruits and vegetables in season and a passion for cooking simple slow cooked food with only the finest herbs and ingredients. My mother had many unique secret local farm recipes that were handed down several generations. My favorites were dandelion jelly and corn bread that she started baking at the end of October when the best corn was husked. My favorite local desserts were shoe fly pie and sugar cinnamon cookies that were to the brim with homemade butter and wheat flour all organic and no less than a cup of sugar and a drop of moonshine to make things interesting. Everything was fresh without artificial coloring and preservatives, -which my mother referred to as horrible lavatory food. I would not suggest that my family ate to live but we did observe the structure around the four seasons. Tupperware was forbidden in our family refrigerator! Leftovers were given to our three dogs and cougar cat, and Veronica, an inherited 40 year old Amazon parrot who loved sugar cookies and other sinful foods! My mother like myself would dream about food. How do you feel about a Sunday pot roast she would bark out as she was chopping spring onions. I feel fine about that I said, except it’s only Tuesday! That made eating at home ever so fun. I felt like a lucky duck with a mother that allowed me to dream about endless food possibilities. She was I suppose, as close as it comes to having a private chef. When I left home at 17 for art school in Pennsylvania, my eating habits changed dramatically. I substituted fresh cut organic feed for the most exciting food I had ever tasted. New York City street food. I quickly discovered hot Indian curries and sweet Korean pancakes filled with sunflower seeds and brown sugar. I was mesmerized by the incredible colors of middle eastern food. I adored Shawarma shaved with thin slices of meat wrapped in warm toasted pita bread. When I was a fortunate dinner guest I would seek out something to bring as a very yummy host gift. These delicious rings of bread sprinkled with sesame bread and powdered sugar. My very humble farm pallet was going through a complete tasting revolution. I began to relate to food in a completely different way. This was partly due to an incredible visionary who happened to be my art school professor. Her name was Geraldine Stutz. Ms. Stutz totally redesigned Henri Bendals into an incredibly chic retail brand. I began to connect the dots between food fashion and art. Ms. Stutz made me realize that fashion was about lifestyle and how we entertain, live and eat. She was directly responsible for bringing the iconic Lee Bailey, the expert on the stylish life well lived, to her store. Lee had an incredible ground breaking food and accessories boutique on the first floor of Bendel’s. I became obsessed with food and fashion. I followed several chefs both here and abroad that spoke to my palate. 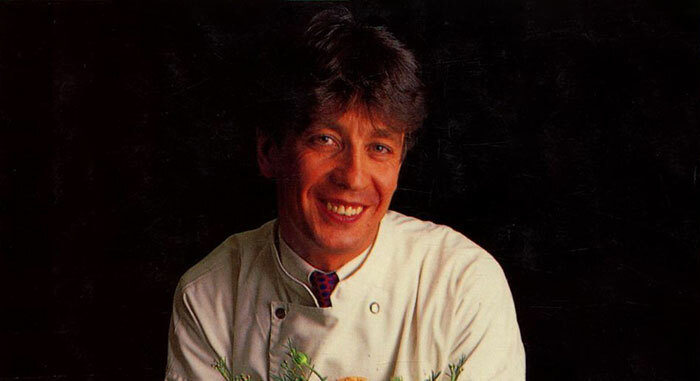 I was very keen on a young Provence French Chef by the name of Antoine Bouterin. After reading the insatiable Gael Greens review about a young French chef named Antoine Bouterin who was the star chef at Le Perigord. A tiny mid fifties French restaurant in mid town New York. Gael was delirious about the nutty brown butter perfume of classic French perfume and the garlicky accents of Bouterin Provincial cooking. His signature dish was L’agneu a la cuillere. This lamb was cooked so slowly it could be eaten with a spoon. Antoine’s dishes were so complex in flavor but had all the soulful disguised markings of comfort food. Gael Greens review of Antoine’s approach to food made everyone happy. Her review made me compelled to spend my life savings on a four course prefix meal at Le Perigord. I knew all chefs generally worked Saturday night and I checked his schedule and booked a back table near the kitchen. I showed up at the restaurant in a cotton shirt starched to death with a navy blue tie and blue blazer with my brass button shining like a high school marching band. I felt like I was part of Leonardo’s last supper. Each of the four courses were beautifully paired with delicious French wine. My favorite was his vegetable tart drizzle in truffle oil and a classic style Granny Apple cake. I really couldn’t compare his Apple cake to that of my mother’s. However, the ingredients had the same fresh garden taste that were beyond delicious and familiar to my DNA palate. I ate ever so slowly and was just finishing coffee when a very tired chef walked out of the kitchen. My very kind French waiter introduced me to Antoine. I was terribly nervous and mumbled that I was a huge fan and had been following his success! He was running to dinner as a guest but invited me to dinner the following evening. I showed up in the same uniform and we had an incredible meal. We talked for two hours and had so much in common. We were both raised by our mothers and grandmothers and grew to love farm to table. A friendship that developed into a 30 year brotherhood. I was fortunate enough to have Antoine prepare many meals and all I know about food and the art of classic dining was because of Antoine Bouterin. All of his culinary principles I used when opening up my hotel and restaurant in Sri Lanka. When I decided to move to Sri Lanka during a 30 year civil war to open a luxury boutique hotel and restaurant on the beaches of a remote fishing village, my friends wanted to medicate me for even thinking of investing in a country torn to shreds with an ongoing civil war. A place surely where no one would visit never the less vacation, with the exception of an occasional CNN War correspondent or a few backpackers looking for budget accommodation. Nevertheless, I charged ahead at full speed along with a New York team of architects and created a 6000 square foot neo-classic villa which I named 23 Palms. I was completely unprepared for war, political unrest and a completely different way of life. Things were upside down and inside out! What I thought was up was really down it was very much like going down Alice’s rabbit hole. However, I stood by my vision of opening a Hotel that offered our guests a complete barefoot Luxury experience with amazingly cooked field and sea to table fresh vegetables and fish. 23 Palms soon became a weekend getaway for the embassy crowd in Colombo who grew tired of war and road blocks. My dark horse was changing her color and the hotel became the topic of conversation. We were the topic of a a lot of buzz with local and international press. Elle magazine voted the hotel the number one honey moon destination in South East Asia. 23 Palms became a rarefied experience with guests enjoying a private chef 24/7, a personal butler and a chauffeur driven Mercedes. It was ratified luxury! Fortunately, most of the war was in the north of Sri Lanka so my guests and I were spared daily bombing with the exception of the naval base a mile away that were occasionally attacked by sea and air. Teddy Roosevelt, Ernst Hemingway and Prince Harry would have certainly been regular guests. The hotel was all inclusive. My goal was to keep my guests well fed and well sunned. The hotel sat on 600 feet of beautiful Indian Ocean beach front. My culinary aspirations were to create an organic simplistic series of menus that infused all the amazing spices, herbs and unique vegetables and fruits known to Sri Lanka. All of the chefs that I hired had little if any training in the art of eating delicious western cuisine. However, they were all passionate about sharing special herbs and spices and secret Sri Lankan village recipes that their mothers and grandmothers had passed down from generation to generation. I invited grandmothers and fathers to visit the Hotel to share and teach traditional village cooking. They were all so passionate about cooking with their families and love of feeding those they loved. I hired Asanka, my adopted son Lasantha and Wasantha to be my green team chefs who were in a 24 hour rotation serving breakfast lunch and dinner. The challenge was creating a series of menus that integrated both eastern and western palate. The challenge was getting the team to actually taste their dishes they were preparing for guests. Sri Lankans have rice and very spicy curry as part of their daily diet. It just never occurred to them to taste the food they had prepared. Over time we successfully created a beautiful team and some amazingly exotic meals for guests and friends. A few years ago I sold the hotel and moved back to East Hampton, where I had lived 20 years prior to creating JK Chef Collection. Both Jeff Purrazzi, my business partner and I, realized, like my mentors Antoine Bouteron, Alice Waters and Lee Bailey, that simplistic food can be deliciously healthy and flawlessly prepared. Our objective is to assist people living in the Hamptons and now also in Uruguay, South America, find a professional chef. Jeff and I have carefully selected chefs from around the world who are well versed in a variety of cuisines. However, our main focus is the East End where the farm and farmers grow, arguably the best produce, herbs and spices in America. With access to these ingredients, cooking is a joy and dishes taste as close to their origin as possible. Our chefs are sensitive to our clients taste and the farms that best grow those ingredients creating original, pitch perfect dining experience. We are keenly interested in the provenance of ingredients and preparing food that reflects region, terroir and season. Jeff and I are forever expanding our culinary library which is deep and broad. For ingredients that can not be obtained locally, our chefs draw on national and international resources developed across the years of preparing delicious food. Our chef collection team all share the same simple philosophy: Astonishing meals have more to do with inspiration and improvisation according to availability of organic fresh resources rather than hewing to rigid recipes. The next best thing to eating food is talking about it. Jeff and I have weekly round table discussions with JKCC members focusing on culinary trends and new dietary discoveries. JKCC has created a refined culinary experience. Carrots that taste like caviar, stripe bass off the boat in Montauk, seared local scallops with a little more than a dusting of thyme -local, of course and corn so fresh that it is eaten off the stalk.